Emilia Doerr writes a short (but informative) article to the Web Marketing Today bog about the effective usage of Flickr to promote your local business (Worth reading it in full). 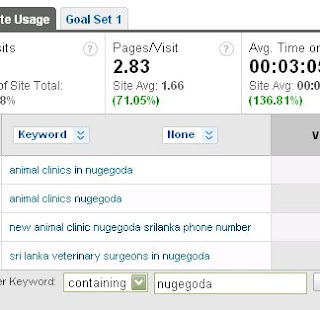 The post particularly appealed to me because I have already tested Flickr as a web marketing tool for small businesses, to promote my wife's pet clinic in Nugegoda (Sri Lanka). It wasn't intentional at first place, even though I knew how effective Flickr could be in enhancing the web presence of any business. In fact we've been using flickr as a social media marketing tool back at my work place for some time now. What I did was, just uploading few of the photographs I've taken at the opening of the animal clinic to my existing personal flickr account. I consciously used SEO friendly titles for the images, and related keywords in the image descriptions. 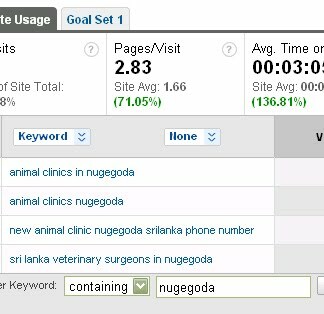 Within a few days, few images that I uploaded to my flickr account (specially the location map) started to appearing on Google search results for many of the relevant keywords for "animal clinics sri lanka", "animal clinics in Colombo" "animal clinics in Nugegoda area" etc. First; I was surprised to see people finding us on Google using these keywords (See the screen shot above, from Google Analytics reports). I never thought Sri Lankans are already Googling to find local businesses around their neighborhood. Even more surprising thing for us was to attract two regular clients to our clinic, who found us on Google and on our Facebook fan page. Just a two clients sounds not a big deal, but this is within the first 2 months of our opening. "Search Engine Marketing" and "eMarketing" are fast becoming viable channels for reaching potential customers in Sri Lanka, especially for the small and local businesses. Larger corporations might still not get the "mass appeal" or the "impactful quick results" they expect from their marketing budget. No worries! They can continue to feed the invoices of big advertising agencies, and carry on the traditional interruption marketing tactics!! Flickr can be a handy tool for local businesses when it comes to their SEO efforts, because the competition for the keywords they are aiming to optimize is relatively lower than for national or cross-border businesses. Because, you are narrowing down your scope to the specific geographic area you are catering to. A restaurant in Mount Lavinia, does not necessarily be the number 1 on Google search results for the keyword "restaurants in Sri Lanka". Because, if someone searching for "restaurants in Sri Lanka" on Google, he probably is trying to plan a round trip to Sri Lanka, or writing a restaurant guide for Sri Lanka. Only a genuine customer, who is seriously looking for a place to dine out in Mount Lavinia area, will search for "restaurants in Mount Lavinia". If you are after serious business; what you should aim at is the keyword which generates you serious customers. If you are just going after the number of hits to your website; you can aim at more fancy keywords with higher volumes of impressions. I can see there are few local businesses in Colombo and sub-urbs already using some eMarketing tactics to promote their products and services. But still, largely they are limited to either broadcasting email messages through an email marketing agency or setting up a Facebook Fan page and expecting people to become fans. The problem with these email marketing agencies and eMarketing experts is, they are knowingly or unknowingly spoiling the opportunities by overdoing certain tactics. If such "overdoing" of eMarketing tactics lead to creating mistrust among the Sri Lankan public, in the future that will hinder the potential effectiveness of using such tools for a large number of small and local businesses. Yep all these free internet sites can be used as excellent marketing tools if you use it correctly..